Good day everyone! 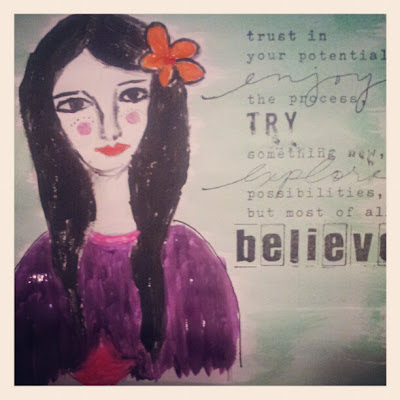 For those of you who visits my blog, knows that I am trying some sort of a mixed media thing. I know I've tried spreading some acrylic paints on a canvass and stick a photo. Not sure if that is a type of mixed media. But what I am trying to achieve now is to be able to just paint a womanly figure or face and not really sticking a photo. I am not sure what I want for now, but what I know is I will keep on doing things and hopefully will achieve something as I keep on practicing. I don't have proper brushes and mediums yet, so I am currently using things that I have. I will try to go out next week and get a multi-medium and maybe some acrylic paints, brushes and whatever it is that I think I will need. Anyways, I also like to share with you one of my favorite stamp which I used on this one. I used this stamp many times on different layouts, like I said, it's my favorite! I am entering this on Unity's Friends With Flair. I just draw a lady and paint the background and stamped my quote on the side. I only used Instagram to take photo and used the Amaro setting. Below are some of the projects I did where I used the same stamp. Thank you for looking and have great day! So many uses for the stamp! Cool. This is one of the reasons I love stamps... and they can last forever! Wow, these are all amazing and they all fit this great stamp! gorgeous! great that you are trying mixed media - I've gotten the products, but am still too scared to try it. I love the layout where you embossed the stamped image and misted (or inked) over it in pink! Lovely layouts. Great use of the stamp. Your mixed media project is awesome! I love the stamp you used too. 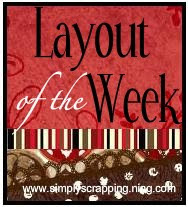 The layouts you used it on are also wonderful! very nice work and colors. I love your unique projects featuring these stamps! Awesome work! I love the stamp all your layouts and the canvas!! These projects are awesome! Thanks for sharing! Great way to show how versatile the stamp is! What nice projects...all with just one stamp!